The Liverpool City Region Apprenticeship Hub recently held a ‘Skills Show’ event and Acorn Insurance were delighted to be in attendance as an exhibitor. The event gave local Sefton-based businesses the chance to reach out to the community and offer School and University leavers the chance to get to know a bit more about their organisation and the opportunities therein. Acorn Insurance were delighted to meet with members of the community and introduce our company to those who may not be aware of our work, in an engaging & fun environment. 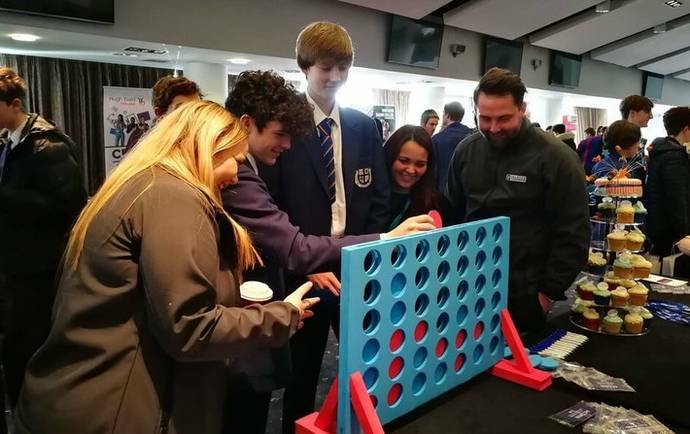 Our giant ‘Connect 4’ game certainly drew a lot of attention and provided us with the chance to talk with young people from the local area about their aspirations. This also gave us ample opportunity to field questions about the benefits of working for Acorn Insurance. With lots of exciting opportunities becoming available within our company, we welcomed the chance to discuss these with potential future colleagues! Reviewing some of the comments we received, we were pleased to get some really positive feedback from the enthusiastic, young visitors we had to the stand. Indeed, all the feedback we received confirmed it had been a useful chance to talk through possible careers in insurance with the members of staff present. The positive feeling was mutual, in that it gave us plenty of opportunity to discuss promising roles in motor insurance, as well as different aspects of our business. We were also excited to meet with other local businesses and impressed with all who exhibited. The Apprenticeship Hub hosted a wonderful event, and we relished the chance to demonstrate our own fresh approach to Insurance to all those who were kind enough to visit our stand. Our Acorn Insurance branded cupcakes certainly proved a huge hit, with attendees and exhibitors alike! We’d like to take this chance to thank the LCR Apprenticeship Hub for putting on such a welcoming event, which all of us who attended from Acorn Insurance thoroughly enjoyed. For more information visit the Apprenticeship Hub website. Acorn Insurance is in a period of growth, with many appealing employment opportunities available. Visit our current vacancies page to see if any of our exciting current positions suit your skill-set! You will be joining a fresh company on the rise, with fantastic prospects.